Herbert, George, M.A., the fifth son of Richard Herbert and Magdalen, the daughter of Sir Richard Newport, was born at his father's seat, Montgomery Castle, April 3, 1593. He was educated at Westminster School, and at Trinity College, Cambridge, graduating B.A. in 1611. On March 15, 1615, he became Major Fellow of the College, M.A. the same year, and in 1619 Orator for the University. Favoured by James I., intimate with Lord Bacon, Bishop Andrewes, and other men of influence, and encouraged in other ways, his hopes of Court preferment were somewhat bright until they were dispelled by the deaths of the Duke of Richmond, the Marquis of Hamilton, and then of King James himself. Retiring into Kent, he formed the resolution of taking Holy Orders. He was appointed by the Bishop of Lincoln to the Prebend of Lcighton Ecclesia and to the living of Leighton Bromswold, Hunts, July 15, 1626. He remained until 1629, when an attack of ague obliged him to remove to his brother's, house at Woodford, Essex. Not improving in health at Woodford, he removed to Dantsey, in Wiltshire, and then as Rector to Bemerton, to which he was inducted, April 26, 1630, where he died Feb. 1632. 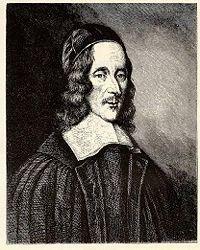 The entry in the register of Bemerton is "Mr. George Herbert, Esq., Parson of Foughleston and Bemerton, was buried 3 day of March 1632." His life, by Izaak Walton, is well known; another Memoir, by Barnabas Oley, is forgotten. Herbert's prose work, Priest to the Temple, appeared several years after his death: but The Temple, by which he is best known, he delivered to Nicholas Ferrar (q.v. ), about three weeks before his death, and authorized him to publish it if he thought fit. This was done iu 1633. The work became popular, and the 13th edition was issued in 1709. It is meditative rather than hymnic in character, and was never intended for use in public worship. In 1697 a selection from The Temple appeared under the title Select Hymns Taken out of Mr. Herbert's Temple & turned into the Common Metre To Be Sung In The Tunes Ordinarily us'd in Churches. London, Parkhurst, 1697. In 1739, J. & C. Wesley made a much more successful attempt to introduce his hymns into public worship by inserting over 40 in a much-altered form in their Hymns & Sacred Poems. As some few of these came into their collection of Psalms & Hymns, 1741, revised 1743, they were long sung by the Methodists, but do not now form part of the Wesleyan Hymn Book. No further attempt seems to have been made to use the Temple poems as hymns until 1853, when some altered and revised by G. Rawson were given in the Leeds Hymn Book of that year. From that time onward more attention was paid to Herbert alike by Churchmen and Nonconformists, and some of his hymns are now widely accepted. Many editions of his works have been published, the most popular being that of the Rev. Robert Aris Wilmott, Lond., Geo. Routledge & Son, 1857; but Dr. Grosart's privately printed edition issued in his Fuller Worthies Library in 1874, in three volumes, is not only the most complete and correct, but included also his psalms not before reprinted, and several poems from a ms. in the Williams Library, and not before published. The Temple has also been pub¬lished in facsimile by Elliott Stock, 1876, with preface by Dr. Grosart; and in ordinary type, 1882, by Wells Gardner, with preface by J. A. Shorthouse.